Quinoa is an incredibly versatile — and healthy — food that you’ll want to keep stocked in your pantry at all times. There’s a quinoa recipe for pretty much anything — salad, muffins, cookies (yes! ), wraps, side dishes… you get the idea. Quinoa — a pseudograin, or a seed that’s eaten like a grain — is gluten-free and a complete protein, meaning it contains all nine essential amino acids that our bodies need but can’t produce. One cup of cooked quinoa contains eight grams of protein, which is nearly double the amount found in white rice. 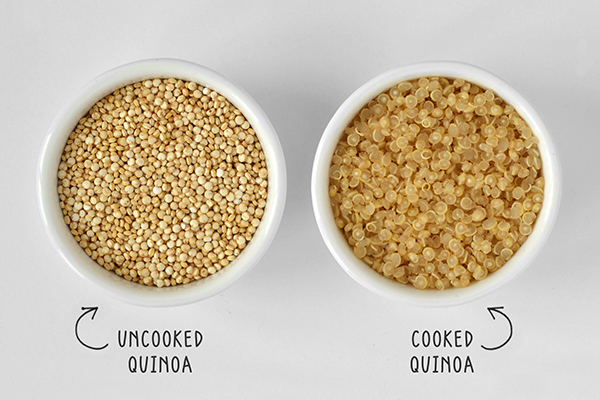 It’s perfect for meal prepping — just cook up a big batch and use it in any of the quinoa recipes below! 1. Wash your quinoa. Use a fine mesh strainer to thoroughly rinse. 2. Add 1 cup of quinoa and 2 cups of water to a pot. For a lighter quinoa with more of a “bite,” America’s Test Kitchen recommends a 1:1 ratio. 3. Bring to a boil, then reduce heat to bring it down to a simmer; cover for 15–20 minutes. 4. DON’T lift up the cover to see what’s going on — let your quinoa cook in peace. 5. Remove from heat and fluff with a fork. 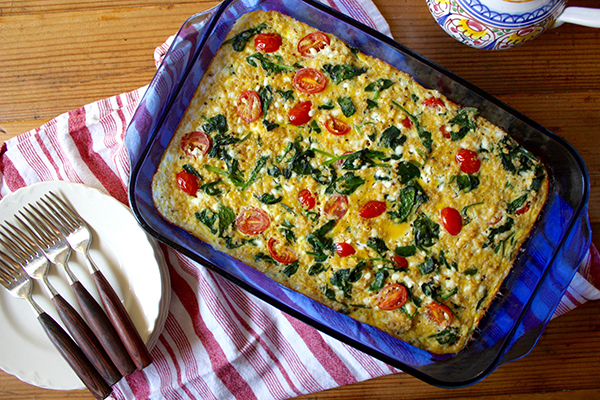 With this easy-peasy, protein-packed casserole, you can make an entire week’s breakfasts in a single ovenproof pan. It makes five servings of hearty, protein-packed meals. Just reheat briefly in a microwave or toaster oven, and go. Get the recipe. 2B Mindset Plate It! : A great breakfast option. Add veggies or a side salad for lunch. These healthier muffins aren’t loaded with sugar or empty calories. This healthy quinoa breakfast recipe features lean ham, nutty quinoa, zucchini, and cheese baked into yummy muffins you can eat on-the-run. Get the recipe. 2B Mindset Plate It! : Add another protein and an FFC to make a complete breakfast. We’re bringing porridge back with this set-it and forget-it quinoa recipe. Plain oatmeal gets a bold makeover in this sweet, spiced breakfast porridge. Steel cut oats are slow cooked overnight along with other hearty whole grains, dried cranberries, and apricots. Get the recipe. Portion Fix Containers: 1 Purple, 1½ Yellow, 1 Blue, ½ tsp. 2B Mindset Plate It! : Makes a great FFC as part of breakfast. With a cornucopia of colorful veggies and hearty greens, this salad is a great meal prep option: The recipe makes 12 portions, and you’re going to want to eat them all. Even after it’s dressed, this salad stores well for up to 3 days! Get the recipe. Portion Fix Containers: ½ Green, 1½ Yellow, ½ Blue, ½ tsp. 2B Mindset Plate It! : A great lunch option for the vegan plan. For non-vegans, replace beans OR quinoa with a protein for lunch. Grilled zucchini and asparagus give this Buddha bowl delicious smoky flavor, while cooked quinoa provides the superfood nutrition. These bowls can be batch-prepped for the week ahead and portioned out into your meal prep containers for easy lunches or dinners throughout the week. Get the recipe. Portion Fix Containers: 2 Green, 2 Yellow, ½ Orange, 3½ tsp. This almost-no-cook recipe can be a godsend on busy days. These light and delicious wraps make an ideal starter, healthy snack, or part of a nutritious vegetarian lunch. Get the recipe. 2B Mindset Plate It! : Makes a great veggie and FFC as part of lunch. This bright, flavorful quinoa recipe has a citrusy bite and a satisfying crunch, and it’s packed with protein and fiber. Get the recipe. Portion Fix Containers: ½ Purple, ½ Red, 1 Yellow, 1 Blue, 1 tsp. 2B Mindset Plate It! : Add more protein for breakfast. Add veggies or a side salad for lunch. Say “goodbye” to the sad desk salad, and say “hello” to this gorgeous, satisfying Quinoa Chicken Salad in a Mason jar. This simple recipe is a snap to meal prep, so you’ll have four awesome desk salads for the week in no time. Get the recipe. Portion Fix Containers: 2 Green, 1 Red, 1 Yellow, ½ Blue, 1 tsp. 2B Mindset Plate It! : A great lunch option. Replace quinoa with more veggies for dinner. Simplify your weeknight routine with this recipe that features slow cooker chicken, fresh green peas, and julienned carrots. Get the recipe. Portion Fix Containers: ½ Green, ½ Red, 2 Yellow, 1 tsp. 2B Mindset Plate It! : Add a side salad or more veggies to make a great lunch. This recipe pairs sweet, juicy mango with creamy cashews and nutrient-rich quinoa, then turns up the spice and pumps up the flavor. Get the recipe. 2B Mindset Plate It! : Makes a great FFC side as part of breakfast or lunch. These fun, kid-friendly treats are stuffed with good stuff in the form of hearty black beans, crunchy quinoa, and a savory blend of spices. Get the recipe. Portion Fix Containers: 2 Green, 1 Red, 1 Yellow, ½ Blue, ½ tsp. 2B Mindset Plate It! : A great lunch option. Why make boxed stuffing when you can make this healthy stuffing featuring tangy dried cherries, toasted pine nuts, and freshly chopped parsley? Get the recipe. Portion Fix Containers: ½ Green, 1 Yellow, ½ Blue, ½ tsp. Pesto isn’t just for pasta anymore. This is an ideal quinoa recipe to meal prep for lunch, made with hemp seeds, fresh baby spinach, and basil. Get the recipe. Portion Fix Containers: ½ Green, 1 Yellow, ½ Orange, 1 tsp. Dried cherries, pistachios, and freshly chopped basil add sweetness, crunch, and herbaceous flavor to this healthy quinoa dish. Get the recipe. Portion Fix Containers: ½ Purple, 1 Yellow, ½ Blue, ½ tsp. These cookies are secret nutritional powerhouses filled with nutty cooked quinoa and gooey dark chocolate morsels. Get the recipe. Portion Fix Containers: 1 Yellow, 1 tsp. 2B Mindset Plate It! : Enjoy this treat as an occasional snack(tional).